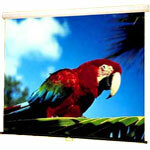 The Luma projection screen is dependable in the conference room, classroom or home theater. Its case and endcaps have a scratch-resistant, white polyester finish. The case is designed to be attractive, sturdy and friction-free. A pull cord is factory attached for all sizes 70-inches wide and larger. Luma case size: 4 3/4 inches high x 3 3/16 inches wide.